Brian C. E. Buhl | Write something good. Click here to find other stories set in the WFGC Hotel. Jake Potts stood in the lobby of the hotel, blinking as his eyes adjusted to the light. In front of him, a massive, twisted oak tree sprang from the lobby floor, reaching towards a domed ceiling decorated to look like a sky split between night and day, with the a brilliant sun shining in a cerulean sky on one side, a crescent moon and twinkling stars on the other. Jake blinked again, looking around the rest of the lobby, trying to take in the hotel’s staff dressed in blue and gold livery, and the massive wooden desk waiting for people to approach for check-in. “Where am I?” Jake asked. His voice sounded strange in his ears, as if coming from a distance. “What?” Jake turned and looked at the British man. He wore a black suit with vest and pocket watch, and he had wings of white hair running back behind his ears. Jake tried to think. The first memory that sprang to mind, still painful and fresh, was picking up the phone at home and hearing a crackling voice deliver news of the accident. Jake shook his head. No, that wasn’t the last thing he remembered. The call had been weeks ago. The memory just refused to fade like the rest. Jake locked gazes with the British man for a moment. Then, like morning fog giving way to sunlight, details in his memory became clear. He remembered packing his bag and leaving the foster home. He packed everything because he knew he would not be returning. And he remembered this stranger’s name. Jake took a deep breath. He remembered something, but he didn’t believe it. He looked back into Miles’ eyes. Jake opened his mouth to deliver a stronger swear word, and stopped. A bitter taste coated his tongue, running down his throat and making him gag. He clapped a hand over his mouth and stared as Miles’ lips twisted into an impish grin. As soon as Miles took a step towards the front desk, the awful taste of soap in Jake’s mouth disappeared. He licked his lips, wondering if he’d imagined it. Had Miles done something to him? No. Impossible. Magic wasn’t real. Could Miles have hypnotized him? Jake turned to watch Miles at the front desk. The dapper British gentleman smiled and spoke with animated hands to the person behind the counter. Jake tried to look at the night clerk and found himself staring at the white marble flooring that surrounded the massive tree. The huge oak came right out of the floor with no visible gaps to expose the soil beneath. Frowning, Jake tried again to look at the night clerk. He blinked, and then stared at an ornate painting on the wall depicting a knight in silvery armor astride a massive black horse. The knight held a gleaming sword in one hand as his other hovered near the edge of his visor. “What the hell?” Jake said. He remembered what Miles had said before and tried to focus his thoughts. Gritting his teeth, keeping his intention clear in his mind, Jake slowly turned to look back at the night clerk. A muscle spasmed in his neck and he ignored it. A figure stood on the other side of the massive desk, but Jake’s eyes refused to focus. His vision blurred, and he felt a tear run down his cheek. When his head began to ache, he let his vision turn away. The tree stood before him, tiny decorative houses lining its massive, twisted branches. “What’s happening?” Jake’s head throbbed, though the pain began to subside. Before Jake could pull away, Miles reached forward and wiped the tear from his cheek. When Miles didn’t withdraw his hand, Jake looked down at it. Blood covered the tip of Miles’ finger. Jake reached up and wiped his eyes and his cheek. He felt the tacky warm blood on his fingers before he looked down to confirm. Miles hadn’t tricked him, and he hadn’t hypnotized him. Jake sat in a creaky wooden desk chair in Miles’ room. They shared adjoining suites, and Jake could see his unmade bed through the open door between their rooms. Hunger twisted Jake’s stomach into knots, and he hoped that the joke or farce would be over quickly. Jake heaved a sigh and looked towards the door. He wondered what his British host would do if he just got up and left. “Take this.” Miles offered what looked like a brass thimble and an eye dropper. Jake opened his mouth to argue, then stopped. He raised a hand and touched the corner of his eye. He had seen things already that he couldn’t explain. What would be the harm in going along with Miles? If it got them down to breakfast that much sooner, it would be worth it. Jake did as he was asked and sat up straighter in his chair, mirroring Miles’ posture. Jake sat back in his seat. He felt his cheeks warm, and he wanted to be anywhere out of Miles’ presence. Jake knew that he’d been rude to the British gentleman, and getting called out on it made him feel small and ashamed. He wanted desperately to see his parents. Of course, his father wouldn’t have put up with Jake’s tone or behavior. Jake’s shoulders slumped and he wished he could crawl into the thimble and hide under the tiny pool of water. Jake swallowed and reached to touch the corner of his eye again. Jake closed his eyes and tried to go with it. He tried to imagine the things Miles had described, but neither doors nor fog gave him a sense of clarity. He kept seeing the door close, and the fog return, and it all reminded him of a life he’d never have again. A sharp comment formed on Jake’s tongue but he bit it back. He was concentrating. What did Miles think he was doing? He imagined wiping a hand across a foggy mirror and seeing his own, red-rimmed eyes looking back. He visualized ripping wrapping paper off a package. The last Christmas with his parents, his mother had given him a leather jacket. Jake pushed away the thoughts of his mother and his jacket and reached for a memory that wasn’t so close to recent events. He thought back to a science class. The teacher had smudged something oily on a plate of glass, and all of the kids took turns looking through the microscope. Jake remembered twisting a dial, raising and lowering the glass until the circle of empty white light solidified into an image of tiny, translucent cells, swimming in pale liquid. Jake shook his head as put the glass into the thimble. The tiny dropper drank the water and glimmered in the hotel light. He tipped his head back and held the dropper over his left eye. He squeezed, the drop formed and fell, and a split second before the liquid touched his naked eye, he thought he saw a golden light. Then the cool moisture was there. He blinked and raised a hand to wipe the water away. Jake set the thimble and stopper down and turned towards the indicated wall. A framed painting of a farmhouse interrupted a cream-white surface. Faint shadows drew darkened lines diagonally from carpet to ceiling. It looked like an ordinary hotel wall. “I told you, it didn’t–” Jake started. The wall rippled. Something long and sinuous slithered just beneath the paint. The creature stretched along a narrow passage Jake hadn’t seen before. Jake thought at first it was a snake, but its thick body didn’t seem to end. Jake’s chair fell over as he tried to get away. He propped himself on his hands and crab-walked backwards, away from the wall. Miles put a hand on his shoulder and stopped him. “What’s that supposed to mean?” Jake realized he’d shrieked his question. His breathing came in short gulps. He wanted to look away but he couldn’t turn his head. Miles’ firm hand kept him in place on the floor. Jake blinked several times before reaching up with one hand and covering his left eye. The undulating image and the corridor within the wall disappeared. Through his right eye, he saw the painting and the plain off-white wall he’d seen before. He quit trying to scramble away from it. Jake lowered his hand and looked. The stopper appeared as it had before with its smoky glass and its bright red rubber stopper. Closing his right eye, Jake saw something else. The stopper glowed with a soft golden light. Jake stared at the gold disk in Miles’ hands. In spite of the otherworldly light that surrounded it, in spite of his heart still beating fast from seeing a monster slithering through the walls, Jake clung to his doubts. “Why don’t we have a little stroll around the hotel?” Miles asked, closing his hands around the Master Key. Before Jake could form words to protest, he found himself walking down the hallway next to Miles. Wood-paneled walls stretched out in front of him, occasionally interrupted by immaculate white doors with ornate brass handles. More paintings of countrysides and farmhouses dotted the walls, each composed with exquisite detail, none memorable enough to capture Jake’s attention as he walked past them. “Where are we going?” Jake asked. Jake started to ask another question, then stopped mid-step. He turned to his left and stared at the wall. He covered each of his eyes in turn. Through his left, he saw a closed door like the rest in the hallway. With his right eye, the wall continued uninterrupted. Jake reached for the handle. His hand passed through empty air. Jake lay on his bed above the covers, his fingers knitted behind his head, his eyes fixed and unfocused on the ceiling. Jake and Miles had walked for almost two hours before the effects of the eye dropper wore off. During that time, he’d seen things he couldn’t believe. One of the phantom doors had opened to reveal a long-haired goat chewing a cigar with an intelligent gleam in its bar-shaped eyes. Only it hadn’t been chewing. It had been smoking. Through a window, Jake had seen what looked like a modern bathroom dominated by a velociraptor, snarling and slashing the linoleum, like something out of a Stephen Spielberg movie. They passed an elderly woman in a wheelchair that looked normal enough, except for the silenced pistol tucked into her knitting bag. Jake saw dozens of things he had no explanation for, any one of which would have been enough to keep him awake at night. Then there had been the explanations. All day, Miles went on and on about lay lines, incantations, the history of magic… it had all been overwhelming. The sun had set long ago and the clock had made the transition from large numbers to small. Laying on his bed with his mind swimming through memories he couldn’t catalog, sleep eluded him. With only one lamp lit, long shadows reached dark fingers across the walls. Jake stared at them, closing one eye. After everything he’d seen, he half-expected to see something looking back at him through the darkness. He focused. For just a moment, he could almost see the outline of a tentacle, long and sinuous. Or was his imagination getting the best of him? An unrelenting silence pressed down on Jake. It had never been so quiet in his home. His mother always had something going on the television. Half the time, she couldn’t tell you what was playing. She just wanted the noise, she’d say. Even after the accident, after Jake had gone to the foster home, there had never been true silence. The foster home had creaked and hummed around him like a living thing. However else Miles had disrupted Jake’s life, one constant remained: Jake’s mind found its way back to his parents and the accident. He didn’t like to think of it, but he couldn’t avoid it. How can a person make themselves not think of something? If Jake’s dad was there, he might have had an answer. His dad was so smart. He’d work on crosswords with a pen. If Miles had been pulling some sort of trick on Jake, Jake’s dad would have seen through it. Jake wished his father was there right now, if only to help Jake process the impossible things he’d seen that day. A sound like fabric tearing broke the silence. Jake flinched from the noise. It came again, sounding through the door that separated the two rooms. Snoring. Miles had a snore like a sputtering lawn mower. Did the British man have sleep apnea or something? Jake added another tally to the mental checklist of things keeping him from sleeping. Jake’s memories tumbled back to another time when snoring had kept him awake. He and his parents had gone camping and they’d had to share a tent. Jake had ducked down into his sleeping bag with a flashlight to read while his parents fell asleep a couple of feet away. When the batteries ran out and his eyes got heavy, he could hear the sleep noises coming from his parents. Eventually, insect chirping and an occasional breeze through dry leaves lulled Jake off to dreamland. Sleep wouldn’t be so easy this night. He’d seen things in the hotel that wouldn’t let his brain rest, like the tiny people that lived in the tree in the lobby. As Jake had watched, one of the little elves raised a hand and waved at Jake. They could see him, just as Jake could see them. Miles insisted that they were in a different world, but they acknowledged Jake’s presence. That made them real. As another one of Miles’ resonant snores penetrated the walls into Jake’s room, Jake sat up. A new thought filled his mind. A possibility. Something he never would have considered before that day. He rose from his bed and crept towards the door into Miles’ room. Jake gave the doorknob a slow turn. It clicked open, and the hinges snitched on him with a creak that sounded like a scream. Jake waited in the open door. Miles’ thunderous sleep noise encouraged him forward. The British man lay unconscious above the covers, an open book spread on his chest. Miles’ head rested on the pillow facing Jake, his mouth open and a thin line of drool running in a line to the fabric. Jake froze part way into Miles’ room, only moving whenever the sleeping man emitted another resonant blast. Miles kept his room neat and organized, with his clothes hung up in the closet and his sundry other possessions tucked into his crocodile skin bags, which he left open on the dresser. Jake tip-toed to the bags and peaked inside. He found the box with the dropper, pulled it out, and moved on to the bathroom. Jake drew water from the tap and tried to activate the dropper. It took him several tries. Jake’s eyes stung and his cheeks felt wet as though he’d been crying. Eventually, the dropper glowed in his hand. This time, he’d dosed both eyes. As he made his way back towards his room, his footsteps slowed. Other items in Miles’ room wore similar auras to the dropper. Items beamed from Mile’s bag on the dresser. The book resting on the British man’s chest bore a rose-colored light. None of the other magical items in Miles’ room lit up like the Master Key, though, which Jake could see radiating from the bedside table drawer. Jake’s plan had been to look for a window that showed him his parents. With so many possible worlds, there had to be one where the accident had never taken place. Jake thought that if he looked hard enough in the hotel, maybe he could find that world. Maybe he’d be able to see them. Maybe they’d be able to see him, too. But why look for a window when you might be able open a door? Jake crept towards the table with the glowing golden amulet. The drawer slid open with a soft sigh. Jake reached for the chain. Miles stopped mid-snore. Jake looked towards the British man, caught in the act, his heart pounding in his ears. Miles snorted, closed his lips, and turned his head. The snoring resumed, a bit quieter than before. Jake withdrew the Master Key and slunk back to his room. He closed the door behind him and released the breath he’d been holding. He had the key. All he had to do next was figure out how to use it. With both eyes opened to the magical world, Jake had a hard time navigating the hotel. He kept trying to follow hallways that didn’t exist. When he found the stairs, he nearly tripped and fell. Whatever world he was looking into had seven steps down before the turn, while the real world had eight. He managed to catch himself on the rail. On the bottom floor, he started towards the lobby, then stopped. If the Night Manager were on shift, what would happen? Would Jake’s eyes start to bleed again? With the effects of the dropper running, would his head simply explode? Jake turned around. Best not to risk it. In front of him, the world flickered and moved. Hallways winked into existence, slanted off into different directions, then disappeared. A casino appeared in front of Jake for a moment, its occupants wreathed in smoke as they pulled one-armed bandits. The slot machines disappeared, replaced with poker tables. A restaurant took the place of the casino, with waitresses wearing blue dresses appropriate for a sock hop. The restaurant morphed into a diner. Jake locked eyes momentarily with a short-order cook that had a scar twisting his mouth and cheek into a wicked sneer. The diner disappeared but the grim-faced cook remained, only he was a bouncer standing in front of a dance hall. A line of waiting guests stood in front of him next to a velvet roped queue. “Can I help you, sir?” a man whispered in Jake’s ear. Jake turned to see an older man in a bright red bell-hop’s uniform. A name tag read “Sammy” in black letters on a gold background. The old bellhop walked forward into the heart of the chaos. Jake kept his eyes focused on Sammy while the geography of the hotel shifted around them. A few moments later, Sammy stopped and gestured towards a beige sofa. Whatever room Sammy had brought them to, it continued to warp through different realities. Jake reached his hands forward and placed them on the back of the couch. He felt the soft material and sighed in relief. It was real. Jake turned to thank the bellhop. Sammy was gone. Jake lowered himself onto the sofa as the hotel continued its dizzying dance. For as long as Jake had walked with Miles earlier that day, Jake hadn’t seen anything like this. Had they just not come to this part of the hotel? Was it not so dramatic before because Jake had only dosed one eye? Perhaps Miles had done something to keep the realities straight. Jake could only guess. With a heavy sigh, he sat back and resigned himself to watching different realms of possibility twist all around him. As the immediate surroundings changed from a bar to a pool to a well equipped gymnasium, Jake noticed one detail remain fixed in place. However else the rooms changed, he could see a stationary door leading out of the hotel. It changed colors and shapes but it did not move relative to Jake. After a few minutes, Jake reached down and pulled up the Master Key. In his hands, it glowed with hope and possibility. He looked from the Master Key to the door. He’d come this far. Why stop now? Keeping his eyes on the door, Jake stood up and walked across the chaos of the hotel. Phantoms of people and furniture appeared in front of him. Jake gritted his teeth and walked through them. He reached a hand up and touched the door knob. A static shock stung him as he wrapped his fingers around the cold metal. Jake pulled out the Master Key and held it against the door and thought of Miles’ instructions on using the dropper. He had to focus and visualize. Visualize what? Probably something to do with opening. Jake’s mind conjured a memory of his old home, before the accident. He visualized the heavy front door which his mother decorated with a wreath every holiday season. He saw the door opening in his mind, with his parents waiting for him on the other side. Plates crashed. A man shouted. Jake turned and saw a waiter surrounded by shards of porcelain, his cart overturned next to a set of dumbbells. A woman with long brown hair, platform shoes, bell bottoms, and a tie-die shirt stood a short distance off, staring at another woman wearing a big-shouldered, tan business suit. Except for their clothing, they could have been twins. Another waiter in a completely different uniform from the first pushed a mop bucket towards the spilled plates, stepping over gymnasium equipment before sliding around the beige couch. “What’s happening?” asked a man in a blue blazer. “Where am I?” asked another man in a space suit, his helmet tucked under one arm. More people appeared, each adding their voices to the chorus of questions and exclamations. Jake heard more sounds of dishes breaking, followed by a gunshot. Then screaming. “Oh no,” Jake said. The door was gone. Where it should have been, a ragged hole in reality yawned, the edges frayed and moving. Beyond the opening, Jake saw another hotel. As he watched, the hole widened by several inches on each side. “This can’t be happening.” Jake squeezed his eyes shut, hoping to break the spell. After a moment, he heard a familiar voice approaching. A hand gripped Jake’s shoulder and he opened his eyes. In front of him, the tear in reality continued to eat away at the wall. “Miles, I don’t know what to do.” Jake turned to the British man and pressed the Master Key into his hands. Wood splintered and glass shattered somewhere behind Miles. The British man rubbed his chin as he examined the rift. After a moment, he took a deep breath and let it out in a sigh. He handed the amulet back to Jake. Before Jake could protest, Miles stepped around him and through the portal. As Jake watched, duplicates of Miles stepped off to the right and left. More copies of Miles appeared behind Jake wearing different outfits. The memory of a lake with a rocky beach sprung immediately to Jake’s mind. He remembered climbing the huge boulders next to the cold, blue water. He tried to put the image out of his mind, but how do you delete a thought once it’s in your mind? The amulet touched something solid. Jake didn’t want to hear it. He tried to pull the Master Key away, but it refused to budge. Jake brought a foot up, braced himself, and pulled harder. Something gave and he fell, landing hard on his back. The door that had not been there slammed shut. The click of the lock echoed into the sudden silence. Groaning, Jake sat up and looked around. The strange warping of reality had ceased, and he found himself on the floor of a sparse lounge. Alone. Jake scrambled to his feet and opened the door. Cold night air rushed in, prickling his skin to goose flesh. He stepped outside and looked around. Miles was nowhere to be found. A crescent moon partially obscured by clouds beamed down at him. The empty night offered no response. Jake found Miles’ book on the bedside table beneath an ornately carved wooden pen. Jake picked up the writing instrument and examined it. On the top where a clicker would be, Jake found a dime-sized ruby set into the dark wood. Setting the pen aside, Jake opened the book and thumbed through it. Half the pages were blank while the other held words and pictures drawn in black ink. Jake turned to the last page and found a message addressed to him. You have already experienced more grief than any young man your age should have to bear, and I hope that my departure does not add to your burden. Though I have only known you for a short time, I am certain that you will make an excellent Guardian. You are inquisitive, strong-willed, and pure in your intentions. Do not let the experience with the rift dissuade you. I believe in you. As you may have already guessed, this book is special. In addition to containing my notes and instructions on the mystic arts, it is also a way for us to communicate. I have a copy, and whatever is written in one appears in the other. But please have a care as there are only so many pages. You will find the resources you need within my bags, and the hotel staff has been instructed to attend to you for as long as you’d like. Study my notes, and for the sake of our reality, do not try and open a portal to reach me. Trust me when I tell you that you are not ready for that. But someday, you will be. Jake traced the last few words with a finger. He picked up the pen, set it to the page, then stopped. What was he going to say? Was he going to thank his brief mentor, or apologize? He riffled through the empty pages with his thumb. Miles was right. There weren’t enough pages to waste. Turning off the light, Jake returned to his room and closed the door behind him. As he saw it, there really was only one thing left for him to do. He turned on the bedside lamp, sat on his bed, and opened the book to the beginning. Hello, friends and family! I’m still alive. There’s a whole lot of things I’d like to talk about and they’re not all related. I’ll try to keep each section brief and easy to read, but I have a feeling I’m going to ramble. After this, I’ll try to post a little bit more regularly. But no promises. Why Haven’t I Posted in So Long? I took the kids to see Captain Marvel on Thursday night last week. Melissa would have gone with us, but she knew that if she we went to the midnight showing in the middle of the week, she’d have to zombie her way through work the next day. I’m not going to go into spoilers. In brief, our reactions were mixed. Bryanna fell asleep early on and slept through most of the movie. Chris left the theater with a huge grin, fist-pumping and talking about how we needed to buy it when it came out on Blue-Ray. As for me… my reaction lay somewhere between those two extremes. To be fair, Bryanna hadn’t had enough sleep going into the late show, and her slumber probably had nothing to do with the movie. Boring isn’t quite the right word to describe the movie. The movie felt like filler. Because of the setting (sometime in the 90s), I knew which characters were going to live. I never thought Carol Danvers was going to lose. I never thought Nick Fury was in any real danger. The future had already been shown to us, so none of the stakes of the movie grabbed me. The special effects were great. Scratch that… the special effects were amazing! The de-aging of Sam Jackson and Clark Gregg was so perfect I stopped thinking about a few moments in. That’s incredible. If you follow me on Facebook, you probably already know that I managed to get a short story into an anthology coming out this year. My story Unclaimed Goods will be appearing in Tales from The Goldilocks Zone released by Flying Ketchup Press. This is huge news! It may be a small publisher based out of Kansas City that accepted me, but it’s still a major success on my road to getting my stories in front of people. In addition, I made the favorites list on the Ink & Insights contest with the first 10,000 words of The Repossessed Ghost. I entered in the masters division and came in 7th out of about 150 contestants. Which reminds me… I should send a link to my blog. Hmm. Again, if you follow me on Facebook, you already know that my birthday was Tuesday, March 5th. Though I was a little grump at work that day, the evening was really nice. Melissa bought me a Switch, and the kids each bought me games for it. I have Zelda: Breath of the Wild! And Super Smash Bros! And a cute little game called Moonlighter! The last couple of days, I’ve mostly been playing Stardew Valley. It’s quiet enjoyment which is what I’ve craved lately. On Saturday night, the whole family went to see Michael Gallowglas’ live storytelling show on The Delta King. It might have been his best performance yet of Bard for Life. Michael drew a great, appreciative crowd, and he delivered. This weekend, Bryanna and I are going to head up to Medford for a little bit. This is a targeted visit, with two main goals. First, I want Bryanna to meet Tim and talk to him. Tim is perhaps the greatest visual artist I’ve ever known, and Bryanna is majoring in art. These two need to talk. Second, I’m going to fix Tim’s computer. I need him to have tools. Also, it’s kind of a late birthday present for him. Next weekend, I’m flying up to Seattle for a writing retreat on a train. I’m going to meet up with a couple of friends of mine from my Twitter writing community. Saturday morning, we’ll get on a train bound for Portland and write. In Portland, we’ll have dinner somewhere. Sunday morning, more writing on the train back to Seattle. This is going to be a really fun event, and I’m hoping to write lots of words. I don’t know if I have plans for the last weekend of March. If I don’t now, I’m sure I’ll have some soon. I reached another milestone on Twitter and it’s past time for me to make another VLOG post. I’ve been dragging my feet a little bit. The weather hasn’t been spectacular, so my “filming location” has been unavailable. Also, I just haven’t been in the mood to do that kind of work. Regardless of whatever funk I’ve been in, VLOG #3 is coming soon. Obviously it won’t be this weekend or the next for the reasons I mentioned in the previous section. If I find time in the middle of the week, I’ll shoot it, edit it, and post it. They’re only five minute videos, right? Chances are good that I’ll be doing it the last weekend of this month. The topic will be about writer support systems, and I might allow myself to go slightly over five minutes for this one. I’m participating with a number of people from my Twitter community to produce what can be described as an anthology spread across multiple blogs. Originally, we were planning on writing stories with a common theme. The idea evolved into not just a common theme, but a common setting. It has stressed out a few people, and I’m not sure how many are still participating. We started with close to 45 participants. I think we’ll have significantly less by the time we post our stories. I’m still planning on doing mine. I’ve got a really great idea. The pitch would be something along the lines of: What if Harry Potter was told he was a wizard, but then he needed a bit more convincing? This week, I’m going to work on the first draft of that story. I’m really excited about it and I’m looking forward to sharing it, along with the links to the other related stories. The short answer is: I haven’t felt up to it. The long answer is: I haaaaaavvvveeeeeeennnnn’t feeeeeeelt uuuuup tooo iiiiiiiit. Seriously, I’ve been in a little bit of a funk, and I’m trying not to post grumpy or sad stuff here. Work has been a little bit stressful. The news has been very stressful. I haven’t been playing music, and worse, I haven’t been writing. I’ve been in a funk. Even the bright spot in February where I went to LTUE still had all the colors bleached out of it like a bad Zach Snyder film. How do I get out of a funk like this? I focus on doing what I can do. I work. I pay the bills. I do the plumbing in the kitchen and clean the litter box. I play The Sims when I know I should be writing, and I try to forgive myself for falling a little bit short. Tonight, on a Monday evening after a long day at work, I’m writing a blog post. Tomorrow, I’ll write a story. After that? Who knows what I’ll be capable of doing? The trick is to just do what you can, when you can. And then treat yourself with kindness and forgiveness. It’s actually been about a week since I crossed the 50,000 word milestone with the novel Synthetic Dreams. I was hoping I’d finish the entire first draft before the end of the month, but I petered out last week. By Thanksgiving, I needed to basically stop doing anything for a while. This whole long weekend, I didn’t write, program, leave the house, or do anything that could in any way be described as “constructive.” I did laundry yesterday. That was the extent of my productivity. We need to take breaks every once in a while, and my need crept up out of nowhere. Now it’s Monday. I’m writing this post during my lunch break at work. A few minutes ago, JPL landed a drill-bot on Mars and at the moment, I’m more excited about that little victory than anything else. This is my last check-in for NaNo and I’m glad to report I now have a non-losing record. 3 out of 6 of my NaNo attempts have ended in a success. Not too shabby. I have a lot of friends that set out on this NaNoWriMo journey with me, and they aren’t going to hit 50,000 words by the month’s end. For them, and for my future self, I want to take a moment to talk about what it really means to succeed at NaNoWriMo. First of all, let’s keep it real. I’m not going to try and cheer you up with a “participation is the REAL winning” kind of speech. That’s not what this is about. NaNoWriMo is purely about adding one more motivator to your writing engine. That’s all it is. You’re a writer 12 months out of the year and not just November. 50,000 words is an arbitrary goal during an arbitrary month. It isn’t real and it doesn’t mean you’re not a real writer if you’re not hitting the 50k goal. Necessity breeds creativity, and deadlines create both necessity and motivation. When November started, we set for ourselves a deadline. Write so many words in 30 days. By framing the writing journey in such a way, we’re activating parts of our brain that we may not otherwise employ when sitting down to write a story. There’s nothing wrong with that! It’s a good way to boost productivity. Then there’s the competitive part of the experience. When you’re comparing your word counts to those of your writing buddies, there is a part of you that is cheering them on. There is also a part of you that really wants to win. To get to 50,000 words first. That’s another part of your brain that isn’t usually used during the writing process. While “winning” may not be the most noble of motivators, at the end of the day, it doesn’t matter. It’s all about digging deep and getting creative. The more of your brain you bring to the keyboard, the better. If you wrote this month, you won. The prize is your collection of words, which hopefully resembles a story. The quality of the prize is directly proportional to the length and readability of the story you’ve created. If you vomited 100,000 words into Word and it’s incomprehensible… well, that’s your prize. If you crafted 10,000 words over the course of thirty days, but it’s exemplary writing… that’s your prize, too. I reached 50,000 words in Synthetic Dreams and I felt great about it for a few minutes, but I’m not really ready to celebrate because the story isn’t finished. I’m in the middle and that’s a treacherous place where slumps happen and plot threads unravel. I love my characters, the premise, the world building, the ideas of the story… but what I’ve written is going to need a lot of editing. There’s a great story here, but it’s not leaping from my head fully formed like Athena. My story is an ugly duckling that’s going to need a lot of time and effort. I’m going to keep going on this story. I’m going to try and get the first draft finished before the end of the year, but there’s no guarantee that will happen. Looking at my outline, I can safely say the end is still another 40,000 words away. Once I get the first draft finished, I’ll check what’s next in my queue. Tying back to NaNoWrMo, the next novel I’m probably going to write is a fantasy. It’s basically The Bourne Identity meets Game of Thrones. It was the novel I attempted my very first NaNoWriMo. I wrote about 10,000 words that November, then another 20,000 words before I abandoned it to work on The Repossessed Ghost. I still like the concept and the characters I created. I haven’t given up on the idea. I just needed to grow as a writer before I could do that story justice. So, taking what I’ve learned over the last 3 or 4 stories, I’m going to write A Clean Slate and it’s going to be great. 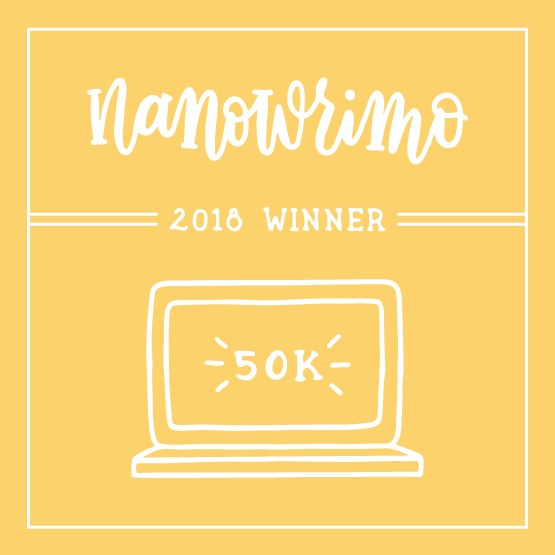 It won’t be an official NaNoWriMo winner, but it will be a winner to me. Whether you wrote 50,000 words or not this month, you still have a prize. Enjoy it! But also remember that it’s not done. No one wants to read your unedited first draft. The first draft is like a pencil sketch. You still need to go through and do the inking and coloring, shading and texturing. A first draft is an important beginning and worthy of being celebrated, but switching from art metaphors to cooking, it’s not done yet. It needs to cook more. Don’t serve your guests something raw. If you’re a writer, I hope you’ve had tremendous success this month! And if you’re not a writer, I hope you’ve at least done something creative that’s made you happy. It’s November 5th. Tomorrow morning, I’m going to get up early and go vote. Bryanna may be coming with me if we get up and go early enough. Then it’s back to the grindstone at work, which has been as intense as expected. I try NaNoWriMo most years. Going into this year, I had very low expectations. The story I’m writing is complicated in every conceivable way, from its lack of gender pronouns to its post-apocalyptic world building, from its complex character dynamics to its layered plot structure. I knew this story would challenge me. The previous years where I made the 50,000 word goal, the stories were written in first person. Since I spent the entire preceding month writing blog posts which are naturally in first person, I entered November with applicable practice. I always assumed that if I was ever going to succeed at a NaNoWriMo, I would have to write it in first person. Otherwise, I wouldn’t be able to generate the story fast enough. I’m coming up on the end of Day 5. According to the official web site, to be on track and make goal on November 30th, I should have 8,333 words written. As I go to bed tonight, I’ll have completed 16,542. At some point along the line, I went up a level. Or maybe several levels. Just last month, I didn’t think I was capable of producing quality writing at this speed. Granted, this whole thing is going to need a ton of editing. The lack of gender pronouns is making for some very clunky prose. My descriptions of these synthetic humans can probably use some boosting, too. Once I’ve finished the first draft, I’m going to have my work cut out for me when I hit the second draft. But it’s not all bad! In fact, quite a bit of the story is really good! I’ve found inspiration in a number of places, and I think the story already hits some of the emotional depth I was aiming for. Sunday morning, Michael Gallowglas asked me what my goals were with this story. He said that I’ve already proven in past Novembers that I have the ability to produce. So what am I doing this month? Is it just about writing 50,000 words, or am I trying to make a great story? As I explained to Michael, those two goals aren’t mutually exclusive. I believe I am crafting a great story. I’m just crafting it way faster than I thought I was capable. Thinking about it today, I think I know why. First, my inner editor has been remarkably silent as I’ve worked. Some of it is due to the clunky prose I already mentioned. My inner editor just doesn’t know what to do with it. Some of it is because I’m experienced enough with NaNoWriMo that I’ve become better at ignoring the inner editor while drafting. Practice pays off, my friends. If it can work for me, it can work for you, too. Another reason I’m blazing along is that I’m writing from the most complete outline I’ve ever produced. It doesn’t go to the level that true plotters enjoy. Jennifer Brozek, for example, would have a much more complete and detailed outline. But what I have is doing what I need it to do, which is keep me focused and on track. I’ve edited this a little bit to remove spoilers. Also, I wound up cutting the “On the way to the bar” scene. My outline is giving me a very basic road map of the story. It details my goals, the location, and tells me where things are going. It gives me an idea of what I’m trying to accomplish with each scene without going into too much detail. I’m the first reader of this story as I’m writing it, so I don’t want too many details. I may have spoiled the over-all plot for myself, but I can still discover some interesting things as I get down to drafting each scene. The third thing going in my favor this year is my time management. Instead of leaving for lunch during the work week, I’ve been mixing a glass of Soylent and heading to a secluded conference room where I can hide for an hour and write. Each lunch, I’ve managed to write around 1000 words. When I get home, I go right to the computer, hook up with my friends on twitter, and participate in sprints. It’s incredibly liberating working to a timer. I know that for as long as the clock is running, there isn’t anything else I need to do. I can just focus on the story, craft the prose, learn more about the characters by revealing details, and do the work. When the timer beeps, I stop writing and screw off for a little bit. Rinse and repeat to victory. There may be a fourth contributor to my success thus far, and it’s that I’m writing with two point-of-view characters. It’s third person limited, and each chapter either follows Dee-ehn or Jayvee. I’m working hard to keep it clear. I avoid head-hopping in the middle of the scenes. The transitions should be clear, and I don’t believe the reader will be confused. Up until The Exorcism of Jack Evans, I always kept to a single point of view. For this story, it felt very natural to alternate. I think both characters are compelling, and it’s fun exploring their competing views. I’m not going to have any problem reaching 50,000 words this month. In fact, if I maintain this pace throughout the month, I might be able to finish the entire first draft before December. If I manage that, it will be amazing, and a real milestone for how far I’ve come. I’ll try to check in from time to time throughout the month. I don’t want to spend too much time blogging because time spent writing a blog post is time I’m not writing Synthetic Dreams. But, I do miss posting here. I think Blog-tober went really well this year, and I’m humbled and glad that so many people stopped by to read what I have to say. If you’re participating in NaNoWriMo this year, let me know how you’re doing! I’d love to cheer you on and offer encouragement. If you’re not participating… you should give it a try some time! You still have time to jump in this year. There’s no financial commitment involved, and the exercise is valuable even if you fall short of the 50,000 word goal.